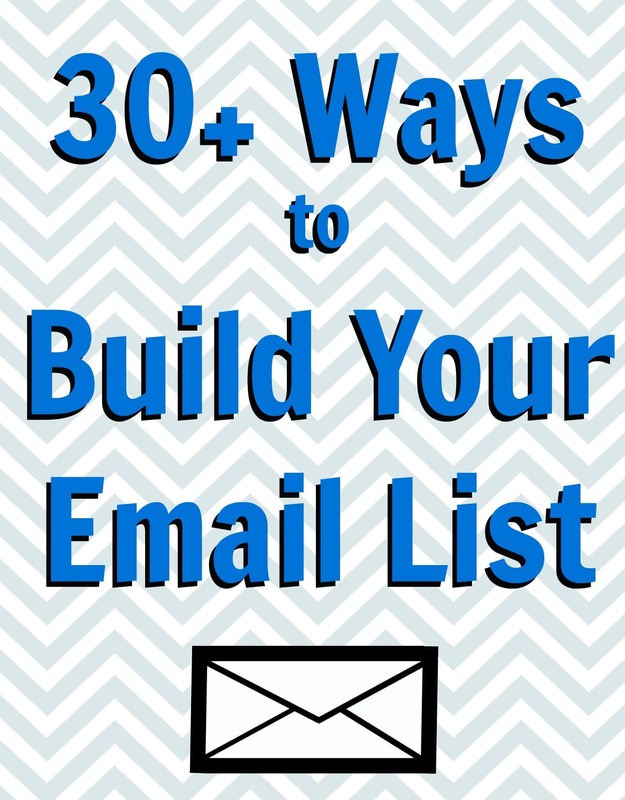 Who doesn’t want a biggest email list? It doesn’t matter if you’re a blogger, podcaster, web series/video producer, or business owner – having a bigger email list allows you to reach out to your target market on a one-on-one level. 1. Put a sign-up form on your sidebar. This seems like a no-brainer, but every day, I see lots of blogs and websites that have no way for someone to subscribe for content. DIY Themes lists the top of your sidebar as the first place you should have your sign-up form. 2. Put a sign-up form at the bottom of every blog post. Someone who readers a blog post all the way to the end is very engaged, so you need a call to action (CTA). Put a sign-up form there as your CTA and you’ll capture email addresses at a higher rate. Read more about compelling CTAs from Flyte New Media. 4. Ask your current subscribers to tell their friends about your list. Give them easy options within your emails to forward and share your content. 5. Use QR codes for easy sign-ups at live events. They’re free to create and give people a very quick way to sign up with any smartphone. Come QR code creation options include Kaywa and Microsoft Tag. You can put them on signage and promotional material like brochures. Make sure your booth is attractive! 6. Put a QR code on your business card. That way, you’re leading everyone you meet to your list. 7. 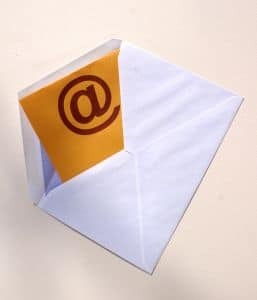 Tell your social followers about your mailing list. Ask them to sign up if interested in receiving more content from you. You can even add a custom sign-up tab on your Facebook page. 8. Tease your content on social media. Tell people how great your latest email is – and give them a link to sign up if they want it. 9. Tell people how many subscribers you have. People like to be part of a large group. So, if you can show a number or say “Join 592 other people…” you’ll play into that heard mentality and get more sign-ups. 10. Try a pop up ad asking for an email address. Some people like them, some people hate them, but for most people, they do convert. The good news is that you don’t have to use a pop up ad that smacks someone in the face the moment someone gets to your site. Play with the settings to find a good solution if you’re going to use pop up ads. Not sure about pop-ups? You’re not alone. Check out The Great Pop-Up Debate. 11. Ask for subscriptions when people comment. Blog commenters are engaged and already giving you their name and email address. Here are some tips from SEOmoz about getting more comments. 12. Get customers to sign up. If you have a physical store, have a sign-up sheet by the cash register where people can give you their email address. If you have an online store, ask during the checkout process. 13. Print a link to your subscription form on your receipt. If your product is digital, you can include the subscription form directly instead of asking them to click a link. 14. Use testimonials. What are people saying about your emails? Show social proof to entice people to sign up. Check out Copyblogger’s tips for getting better testimonials. 15. Offer a free ebook. Make sure the ebook has an enticing title and a well-designed cover, and choose a topic that really grabs readers. Here’s how to write an ebook that people really want. 16. Offer an in-depth case study, report, or white paper. Give your readers something special that they can’t get anywhere else. 17. Run a contest. To enter, people have to be signed up for your email list. TopRank has some great tips on running an online contest. 18. Give people exclusive content. It can encourage people to sign up if they get something via email that they can’t get elsewhere. 19. Host a webinar. Either require people to be on your email list to attend or ask them to sign up afterward. Check out Hubspot’s post on how to host your first webinar. 20. Link to your sign-up form in your email signature. It goes out to everyone, so you should capitalize on the opportunity. 21. Speak at events. Put a link to your sign-up form on the last slide or, even better, create a resource page with all the notes to your presentation (including a sign-up form) and give it to your audience so they can just listen to you instead of trying to take notes. 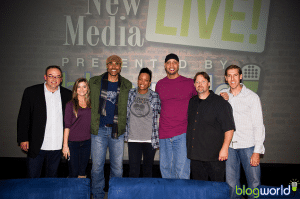 Want to speak at the next NMX? Start working on your proposal now! 22. Create a useful tool, app, theme, etc. for people to download. People love free gifts beyond the text documents that most people offer. If you typically sell this kind of downloadable, create a free version as well to help you collect email addresses. As a bonus, this helps you give people a sample of your product! 23. 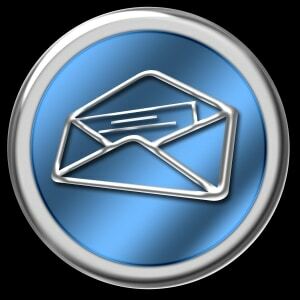 Offer a discount for email subscribers. This works best when you give a substantial discount or bonus freebie on orders that people really want. 24. Promote your email list at the end of guest posts. It’s typically more effective to have a specific CTA at the end of a guest post instead of just linking to the homepage of your blog. 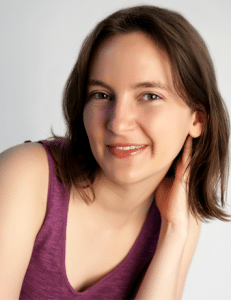 Check out Kristi Hines’ recent guest post on guest posting. 25. Ask people to sign up to your list at the end of videos. Videos are extremely engaging, and not only will you pull in new subscribers via YouTube, but you can also post the video on your blog (and hopefully other people will too). Our video category has some great posts to help you get started creating this kind of content. 26. Host an offline event (like a TweetUp). Afterward, email attendees to thank them for coming and invite everyone to sign up for your list. Here’s a post from Mashable about hosting a successful TweetUp (with many tips that can apply to other meet and greet type of events as well. 27. Play around with the language on your sign up form. Test what works best. What happens if you say “Please sign up…” versus “Please join us…”? What about if you call it an email list versus an email club? 28. Play around with sign-up form colors and dimensions. Sometimes a form that blends into your site works best. Other times, you need a bright, jarring color that stands out. KISSmetrics has some great examples of sign-up forms that work you can check out. 29. Make it as easy as possible for people to sign up. The more information you ask people to submit, the fewer people are going to fill out the form. People don’t like the work of a long sign-up form, and they may not understand why you need the information. 30. Partner with another blogger. Offer a giveaway, free product, or other special jointly to anyone who signs up for both of your email lists. Or, you can do a deal where you promote one another (i.e. you send an email to your list encouraging them to sign up for their list and vice versa). Want to work with a “big name”? Here are some tips for getting past the gatekeeper. 31. Partner with a group of bloggers. This works even better than partnering with just one blogger! 32. Promise future content. A great example is to write a blog post series or regular feature. At the end of every post in the series, ask people to sign up for reminders of more content. 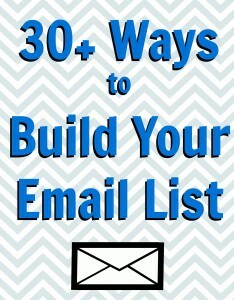 I’ll continue to add to this list as I hear of more techniques for growing your email list. Got a suggestion? Leave it as a comment below! BlogWorld is Over, But Your Work is Not Yet Done. Great tips! I never considered number 27. I will try switching up my words and see how that works! Great ideas, you now have me thinking that I need an email list of subscribers. I know people subscribe to my RSS feed, but looks like having an email list is the way to go. Quite a resource you’ve put together, Allison – and thanks for the kind mention of one of my posts at Traffic Generation Café as well! I’m always trying to improve my email list for my website. I’m a novice internet market and all your tips are great. Thanks! Hi Allison, very useful points for promoting a list. While I’m laying the last hand on my free e-book, I’m almost ready to put one up my self. These points come in very handy, Cheers. Great ideas for thinking outside of the box. I believe anything you can do to set yourself apart from the competition and grab your readers attention is helpful. QR codes are becoming one of the best ways to build not just your email list but your business as a whole. I was looking for good places where I can find them so thnx your QR code creation options I’ll check them out. Great post overall, without an email list I believe you have no business. Whether it’s online or offline, you need a database. What a great list! Thank you for sharing your awesome advice on how to build an email list in rapid time. I look forward to reading your upcoming posts. Keep up the excellent work. This is a fantastic list! One of the biggest challenges bloggers have is building an email list – and you’re right. Make it easy for people to sign up! That’s the most important thing, in my opinion. Thanks for compiling this list, it’s great!